One of the best border plants and loved by bees. Tightly packed clusters of small, purple flowers are produced in abundance , loved by designers and friendly insects alike! Holder of an RHS Award of Garden Merit, you can be assured that it will perform well in your garden. One of the longest-lasting plants in the garden, verbena's flower heads add structure to your borders during the winter. Ideal as a filler in the garden, it is 'transparent', allowing other plants to shine through. Great in mass plantings too. 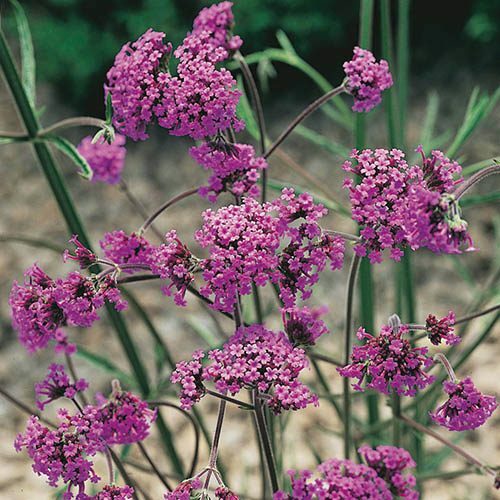 A tall, award-winning perennial with erect, branching stems, Verbena bonariensis is a well-loved garden plant deserving a place in every garden so long as there is border space to plant it. Tightly packed clusters of small, purple flowers are produced in abundance and carried on tall, willowy stems from summer to autumn, adding a sophisticated grace to planting schemes. Also known as Argentinian vervain, it is one of the longest-lasting plants in the garden, with flower heads persisting right into the depths of winter, providing much needed interest. Ideal as a filler in borders, it is 'transparent', allowing other plants to shine through, and one of the best plants around to add structure to the border and attract a host of pollinating insects to the garden - probably why garden designers love it so much. Reliably hardy and very easy to grow, v.bonariensis has been given the RHS Award of Garden Merit, assuring you of its garden-worthiness and suitability for UK gardens and gardeners - whatever their level of experience. As an added bonus, this verbena seeds freely so, once established you're guaranteed a plentiful source of free plants! Leave faded flower heads on the plant over winter, to provide structure in the garden as well as shelter for hibernating insects. Grow in well-drained, moderately fertile soil in full sun. In cold areas, protect with a dry winter mulch. Verbena bonariensis can suffer dieback in harsh winters if cut back in autumn, so it's best to leave the plant until spring and cut back the old growth when you see the new shoots emerging at the base.